Dog crates are very important to dog owners for various reasons. They are used for training, containment and transportation. Choosing one for a small puppy is a bit easier than one for a large sized dog. Such dogs will require a large or extra large dog crate. Choosing the large dog crate that is best for your dog can be a bit confusing when you look at all the products offered in the marketplace. To help you put things in proper perspective so you can make an informed decision, we will look at some of the factors you should consider when making your choice. Bearing in mind the three primary purposes for dog crates, we will look at two major factors to consider and we will also look at how these may affect the use you want to put the crate too. This is easily the most important thing to consider when choosing a dog crate. For large dogs, you need to start your consideration from nothing less than a 42-inch dog crate. This should be ideal for dogs weighing between 71 and 90 pounds. Of course, the height of the dog is of great importance. It is recommended that you make sure your dog can stand and turn around in the crate. So aim for about 3 to 4 inches of clearance on the top of the dog’s head and enough clearance on all the sides for your dog to turn around with ease. It, however, should not have too much space. For dogs weighing between 91 and 110 pounds, depending on their height, an extra large case which is about 48 inches in length may be adequate. Remember, it all depends on the height of your dog. You may, however, want to go for a 54-inch dog crate if you have a dog weighing 110 pounds and above. This type of XXL dog crate is mostly used for great Danes, Saint Bernards and the like. In any case, you must always ensure your dog can conveniently stand and turn around inside the crate. With the issue of the size of the crate taken care of, we can now look at the issue of the type of crate. At this point, your choice may largely be informed by the use you want to put the crate too. One of the most common types of dog crates is the wire type. These are usually made of heavy-gauge wire. They are usually foldable for easy storage and transportation and are also quite heavy because of the heavy-gauge wires. Some of them have demarcations that allow the size of the crate to be modified especially when used for growing puppies. You will also find that they can come with single doors, double doors or even more. Some have a door in front and one at the side while some add a third on top. It all boils down to what is right for you and your pet. Most of these wire crates also come with plastic pans placed beneath the crate. This makes cleaning out the crate easy and efficient. 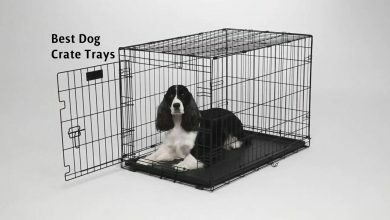 This type of crate is by far the easiest to use and is great for large dogs as you can easily get a large sized wire crate that will not appear to be taking up too much space because of its open design. The advantage of this type of dog crate is that it is portable and can be placed anywhere. Furthermore, it is open and so very well ventilated. On the other hand, during the cold months, its open design may not be a plus depending on where it is placed. The other type of dog crate is the plastic type. This type usually has a plastic body with a wire door and slits by the side for ventilation. Finding the right size of plastic crate for your large dog should be your priority should you choose to go for the plastic type. Some of the benefits of the plastic type are that it is more lightweight, offers more warmth during the cold months and can include other features depending on the brand. A crate you want to use for containment or as a den for your dog may require a different consideration from one that you want to use outside the house or just occasionally. If you are using the crate indoors as a permanent sleeping place for your dog, you may not be concerned about mobility or portability but may be more concerned with aesthetics and how it fits into your general set up. You will find some decoratively designed dog crates that will fit nicely with your home’s furnishing. Some of these are made of wood and nicely finished. These are all options available to you. If you want a large dog crate to travel with your dog, then you will surely need something very sturdy and portable. If you will be traveling by air, then the crate MUST meet IATA requirements. You may want to confirm any other requirements prior to traveling. Choosing a dog crate for your large dog requires that you pay a lot of attention to a number of things including the size and capacity to support your large dog. We have listed some of these important things to note above and hope that these will help your decision-making process. To further simplify the process for you, we have gone ahead to pick out 10 top quality large dog crates and cages. We have carefully reviewed these to give you all the important information you need for each product. 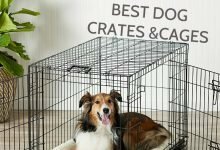 As you look through these ten products, we believe you’ll find that large dog crate or cage that is just right for your dog. Without wasting any more time, let us go right into our review. Petco is a name that a lot of pet parents world over have come to rely on to deliver products that enhance the physical, mental and social health and well-being of their pets. That Petco is a leading brand in this industry is no fluke. With a commitment that borders on obsession, everything it does is geared towards creating a wonderful experience for pets and their owners. As a top pet specialty product retailer, it offers a wide array of products that range from pet food, pet care products, pet toys, to pet training products and more. It also offers pet services which include grooming, training, vaccinations, pet sitting and pet adoptions, among others. There is no doubt that Petco understands pets and delivers products that are just right for them. 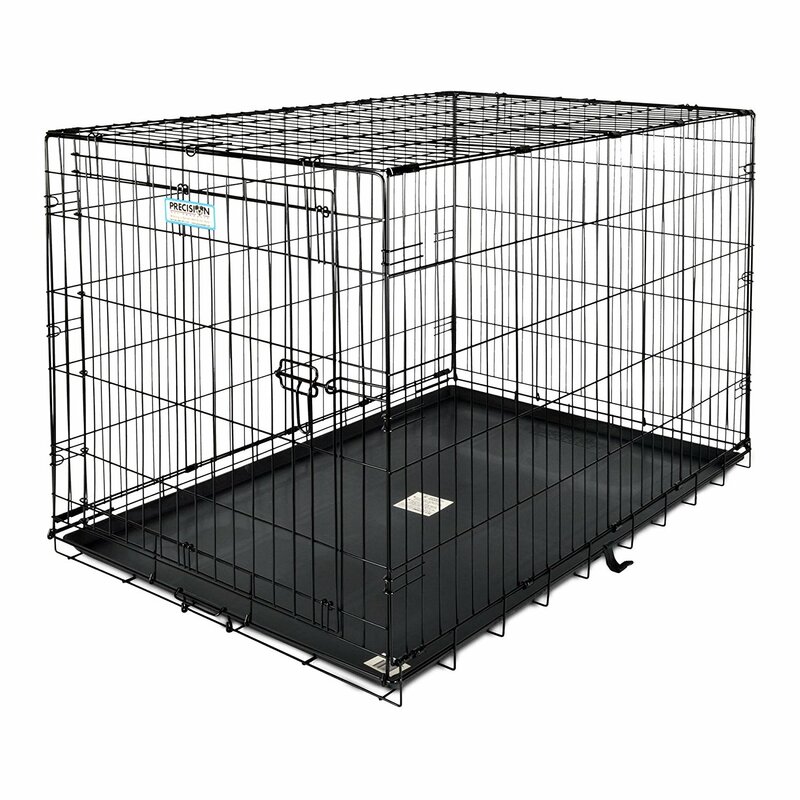 One of the products from the stable of this brand is the Petco Premium 2-Door Dog Crate. This is an XXL dog crate and is an ideal training tool for that large dog that needs housebreaking. This helps you train your dog to understand what can be done indoors and what should be done outdoors. It is a perfect potty training tool. It is very sturdily built and with a dimension of 48 x 30 x 32 inches and a weight capacity of 140 pounds, it can handle the weight and size of your large dog. You will not have any issue with it falling apart and your dog will be comfortably and securely accommodated within its confines. It is very easy to setup and easy to store away. It is collapsible and completely folds to a flat package that is easy to store away or transport. It is designed with two openings for easy access. The dual openings also provide more positioning options. Each door also has dual safety locks so your dog is securely contained at all times. With this crate, hygiene is very easy to maintain. It comes with a plastic pan that slides out, making cleaning very easy and stress-free. While this is an extra large dog crate, it offers other sizes for different sizes of dogs, from the smallest puppy to the 140-pound mastiff. There is something for every user. If you are searching for big dog crates, then you have found one that is not just big, solidly built and very secure but one that is offered by a brand trusted to deliver the best possible products for your pets at every instance. This is the ideal big dog cage for your dog. Get one today and get peace of mind as you comfortably train your dog. In 1921 when Midwest Homes For Pets started its operations, its mission was simple. It just wanted to deliver the best products and great customer support. Today, it is easily the biggest pet home builder in the United States. Though this was not its original aim, its commitment to the delivery of top quality pet products has earned it this well-deserved position. As a subsidiary of Mid-West Metal Products, it inherited the parent’s company’s deep knowledge of metals, sheets, and wires and this has served it well in its production of pet containment products. As pet owners who understand the needs of pets and their owners, the team at Midwest Homes for Pets designs its products with this in mind. It is, therefore, no surprise that its products have consistently been widely received with enthusiasm. The MidWest Life Stages Heavy-Duty Folding Metal Dog Crate offers your large dog security, safety, and comfort. It is designed with heavy-gauge steel wires that are tightly meshed to provide more strength and protection. Despite its heavy-duty design, it is easy to set up and folds down completely for easy storage and transportation, a task which is made easier with the included carrying handle. This particular model comes with double doors (you have the option of choosing the one-door model of the same size) which provides multiple access points, making it more convenient for your dog and also providing more placement options. It also comes with a divider panel that will allow you create demarcations. For an easy and straightforward cleaning out of the crate, it includes a pan which is leak-proof and can easily be slid in or out. It, however, has a stopper that ensures the pan stays in place when you do not want to slide it out. With your dog inside this crate, you can secure him safely with the two bolt latches that you simply slide in to lock and slide out to open. This crate was designed to offer optimum safety to your dog and you. The outer edges are rounded so there is little risk of any sharp edge hurting your dog, yourself or anyone in your family. Measuring about 48 X 30 X 33 inches in dimension, this is a big dog cage. If however, you require smaller sizes, it also comes in five smaller sizes. As far as big dog crates go, this is one you can rely on. More so, it was designed and manufactured by a brand known for the quality of its products. In fact, it backs this product and others with a one year warranty against manufacturer defects. So there you have it. This is your opportunity to get an extra large dog crate that you can use with confidence and ease of mind. Set up as a brand under Amazon, AmazonBasics exists to offer quality and high-end products of different categories to consumers at lower prices. This means that it is a trusted alternative to all the types of accessories you have been looking for or have found but may be too pricey for you. There is hardly anything you need within these categories that AmazonBasics does not have in store. Do not worry that the price may mean that the goods are inferior in some way; it manufactures its own well-made and amazing products and sells directly to consumers. This eliminates the long processes of passing from manufacturer to distributor, and then to the retailer before it gets to the consumer; all these steps hike the price. So rest assured that what you get from AmazonBasics is top quality and there’s no end to what you can find there, from everyday needs like electronics to accessories to specific ones like dog crates and cages such as the AmazonBasics Single Door & Double Door Folding Metal Dog Crate with Paw Protector. This 48-inch dog crate has two doors for ease of access: one in front and the other at the side. It does not just create easy access for your dog; it also makes it easy for you to clean the crate when necessary. One-door crates have the tendency to restrict movement but not this one. It also means that it does not have to feel like a trap or a cage in the traditional sense of the word. Opening both doors lets your dog know that it can come and go freely. Being one of the large dog crates for sale in shops, it comes with a dividing panel. It can be used for both adult dogs and puppies and due to this fact; this dividing panel comes in handy. When you have to use it for puppies, you can adjust the panel to shrink the space so that they do not mess it up but also have room to be comfortable. As they grow, you raise the panel until you can remove it completely. So you do not have to buy another crate for a puppy if you have this one. Besides these, the cage has a protector for the paws of your dog. The lower part of the cage has slim bars that are 1.1cm apart so that there is no risk of the paws getting stuck between bars, causing your doggie harm or discomfort. It is also easy to set up. It comes in its box simply folded down and all you have to do is unfold it, one side piece at a time. It does not need any tool to set it up nor does it take forever. And it is just as easy to fold up if there is no longer any need for it. You see, there comes a time when you would not need it or you may have to move. Just fold it down, one side at a time, box it up and you are good to go. ProSelect is a brand under PetEdge and it specializes in the production of dog accessories like dog feeders, dishes, bowls, cages, crates and so on. It does not just give your dog what it needs but what it wants; its products go beyond just the ordinary to give luxury, safety, and comfort. If you are looking to give your dog the best care and comfort money can buy, whether it is for feeding it or ensuring its safety, look no further than ProSelect and you will be glad. 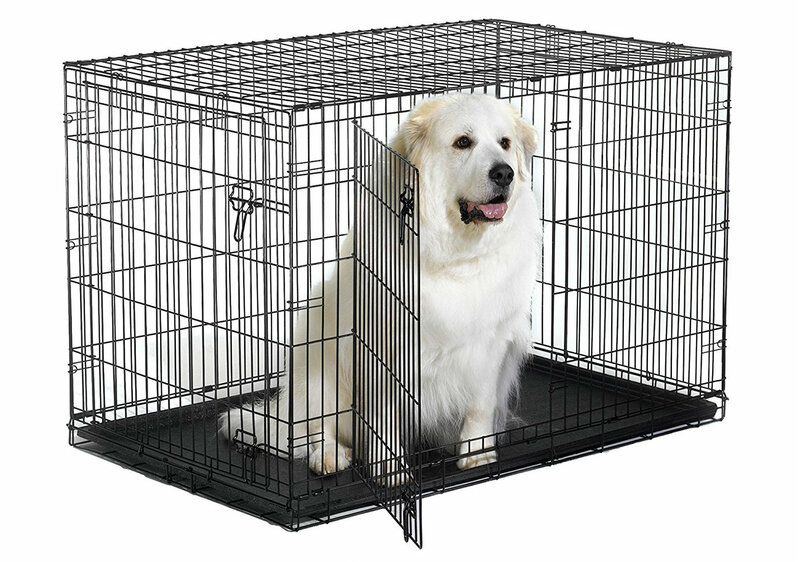 Its trustworthiness is fully exemplified in the Guardian Gear ProSelect Empire Dog Cage. 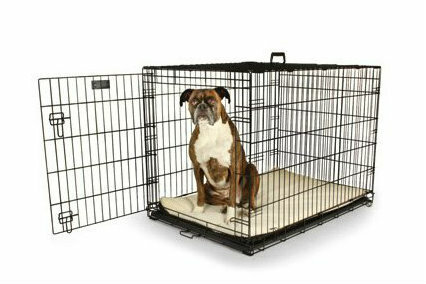 This heavy and sturdy dog cage is made of reinforced steel which can withstand even the fiercest battering or chewing. It may take a while for your dog, which had hitherto enjoyed prancing about the house and yard, to adjust to the new development so you should expect some resistance. However, if you use this steel cage, no amount of chewing or ramming would dent it because no dog teeth are that strong nor is there any breed strong enough to ram its way through it. It is medium sized so can fit into a moderate space. It does not have to take up the undue room and cause any inconvenience. Some people hesitate to get a dog crate because they fear that it could occupy too much room but not only does this almost 36-inch dog crate not occupy too much space, it also can take a dog as big and as heavy as 75lbs. It may not be an exceptionally large dog crate but it goes beyond the usual to serve. In addition to that, it comes with casters that can be removed. Because the dog cage is heavy, it would be difficult to lift so the casters make it easy to move from one spot to another. They do not pose a problem, though, even if you elect not to detach them. Two of the wheels can be locked so that the cage does not roll on its own. And it does not take an army to keep it clean. Its floor may be grated but it has a tray underneath that can be easily removed or reached for cleaning. Every waste goes through the grate into the tray so that your dog does not mess it up and increase the cleaning work. All you have to do is reach under it for the tray and replace when you are done cleaning it. Having more than 50 years’ worth of experience to boast of, Petco does not only offer accessories for the comfort of your pets, and by extension you, it also offers services and advice that add positively to your experience as a pet parent. All it seeks is to have pets that are healthier, parents that are happier and a world where things are better. That pretty much covers all the bases, does it not? You are sure to get some of the finest dog cages and crates from Petco, like the Petco Classic 1-Door Dog Crates, as well as great dog training, pet sitting services, and even vaccines for all your pets. It has got your pet needs all covered, all in one place. The Petco Classic 1-Door Dog Crate comes in different sizes to accommodate your needs per time: small, medium, large and extra-large. You can get a size suitable for whatever size your dog is and for whatever floor space you have available. Just make a request for the right size and you will have it delivered. 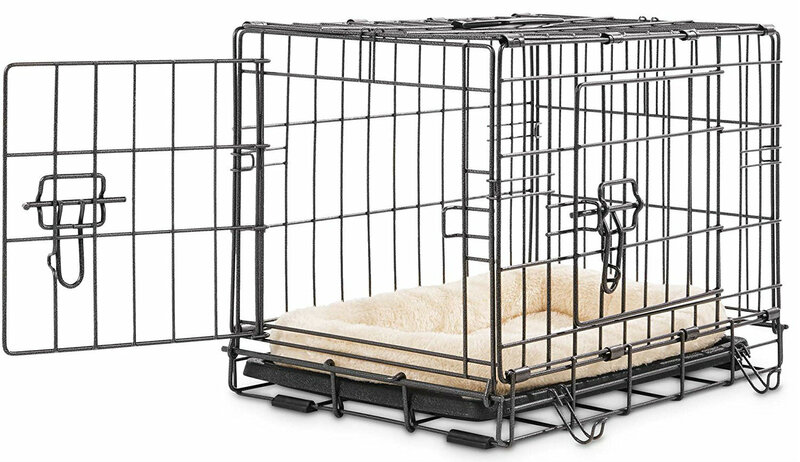 The extra-large dog cage, though, has a dividing panel for reducing or increasing the space within the cage. If your present need for a cage is to train a puppy, you can as well get this one, bearing in mind that it will grow and that the need for a cage does not go away with growth. All you have to do is reduce the space with the dividing panel and as your puppy grows into an adult, you keep adjusting the panel till you can remove it entirely. Furthermore, the wire is coated with powder to eliminate rust. Metal is prone to rust over time but the coating has ensured that this does not happen any time soon. The coating does not only reduce the possibility of rust, it also blunts every jagged edge that could cause injuries to your dog or you. Wire crates do not have to cause injuries and this one proves it. This also means that the elements would do no quick work on it if you decide to use it as an outdoor dog cage. And it comes fully assembled. You do not need tools to set it up nor do you need help. Once you remove it from the box, you simply unfold it and get it standing; no hassles. The same goes for packing it up; just fold it down and box it. New World Pet Products focuses on a diversity of pet accessories to keep your pet comfortable as well as services that aim to help every pet parent maintain their health and safety. Building on the foundation of dedication, dependability, and trustworthiness, New World maintains an exceptional customer-friendly policy, knowing that the customer comes first and their satisfaction is priority one. Its dependability is clearly portrayed in the New World Folding Metal Dog Crate, one of its many products manufactured for your pleasure. So if you have been looking for the best pet care products for your beloved pets, rest assured that New World has got you covered. And no, it is not media hype. The New World Folding Metal Dog Crate is made with two doors and strong bolts so that entering or exiting for your dog is made easy. If your dog is using a crate for the first time, the two doors give it some sense of freedom instead of confinement while in it. The strong bolts on the doors make it difficult for your dog to easily come out; they cannot be broken, either. And they make it easy for you to conveniently reach into the cage at any time. 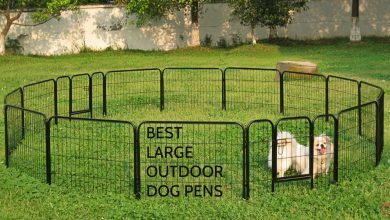 This extra-large dog cage is also suitable for dogs of different sizes. It can comfortably cater for a dog as heavy as 100 pounds and has room for it to move around. 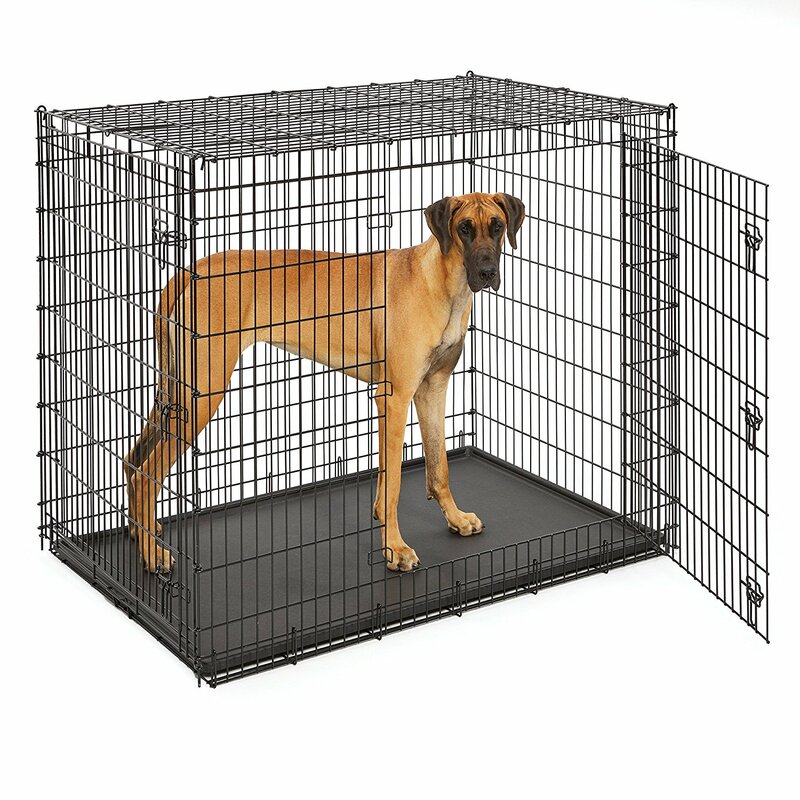 It can serve as a Great Dane dog crate as well as one for a golden retriever. Besides this, it is great for potty-training your dog and for teaching it how to adhere to routines. The visibility that it affords you makes it easy to tell when your dog needs to go so that you can take it outside. Also, it would learn when it is time to stay in one place and when it is time to run around, without your having to say so. Having a workable routine is good for dogs because they are creatures of habit. It is so easy to set up, you would hardly believe it. It is the fold-up type that needs no tool to assemble. This equally means that there is no screw that would accidentally come undone with time and you do not have to spend time disassembling it in the event you have to store it or move to another place. Carlson Pet Products is a company that was started on the idea of providing the best solutions. It successfully achieved that when it introduced its line of gates and barriers to restrict the movement of pets around the house. With a wide array of quality products, this brand is an ideal go-to for pet owners. If you need cages or barriers for your dog or cat, Carlson Pet Products has something good for the situation. Do you need an XL dog crate for your huge canine? 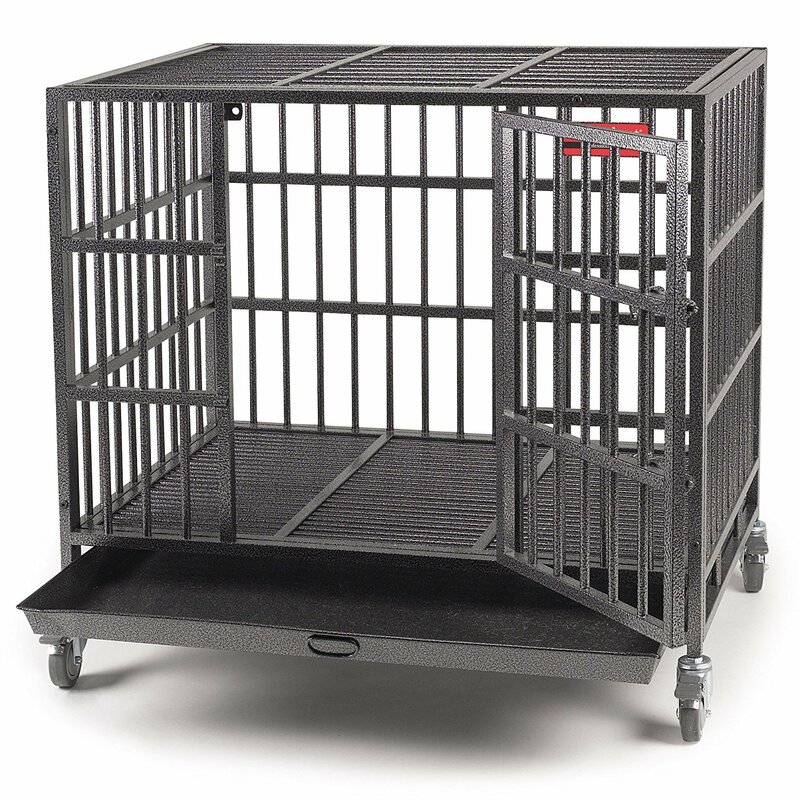 The Carlson Pet Products Single Door Metal Dog Crate is an ideal choice. It is big enough to comfortably house your dog and make it feel quite at home. It is also spacious enough to allow your dog move freely. Now your buddy has a place it can feel secure and comfy in. This crate is made of steel and it is tough enough to withstand your big dog’s might. It has a single door on one end and is fitted with a double bolt lock. With this, when your dog is in, it is in. The locking system is positioned and designed such that your crafty dog still won’t be able to outsmart it. If you are wondering if your dog would be lying on the steel grid of the crate, the answer is no. The manufacturer was thoughtful enough to include a composite pan that is easily removed and washable. That way, you can quickly clean out the dog’s mess and food spill. Another thing you will find cool about this large dog cage is how quick and easy it is to set up. You don’t even need tools to do that. You can even collapse this cage into a compact size and secure it in place for easy storage. 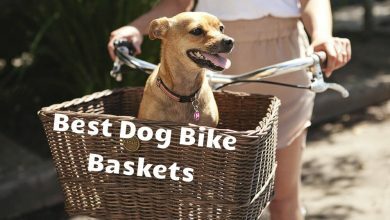 You can also take it with you on your travels with your dog. It won’t take up much space and it will help you keep your doggie’s movement in check. This cage is also a great way to train a new dog to your house rules. If you have a different sized dog and you have already known of this brand’s reputation, you don’t need to worry about missing out. This cage is also available in other sizes. You can get the small, medium, large, or intermediate if your fluffy canine is not extra-large. With focus and specialization comes expertise. With superior quality and consistency comes trust. If you put all those together, what you get is ProSelect. This is a leading brand when it comes to wire cages for pets. 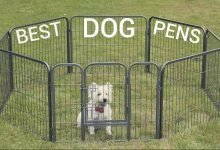 For many years, it has designed and manufactured tough and durable cages for keeping even the toughest of dogs in check. This is why it is highly recommended and trusted by many pet owners. The ProSelect Easy Crates for Dogs is easy when it comes to use and convenience but tough in terms of strength and security. If you have been looking for a giant dog crate, here is a good choice. Its dimension makes it spacious enough for your large dog to lie, sit or stand comfortably in. Whatever breed your dog is, this cage is sturdy enough to house and protect it for as long as you want. It is made of lightweight wire which makes the cage itself lightweight. The weight makes it comfortable to move around so you won’t encounter much of a problem in that aspect. Even though the wire is lightweight that does not make it flimsy. The cage is tough as you would expect from something that is meant to restrict a large dog. It was built to withstand all the barging your dog can give to it. This crate is secured with not one but two latch door locks which assure you that your dog stays in the cage as long as you want it there. Even crafty pets will have a tough time getting through one of the locks. If it so happens your dog manages to get out by working the locks then you might want to enroll it in a college – It means it’s that smart. This dog crate for large dogs is fitted with a floor tray you can slide out for a quick and easy clean up. It also comes with a divider which is also removable. This divider will be quite useful if you get this large dog crate to house two small ones. That way, you just got yourself a double dog crate for the price of one. You can thank us later. 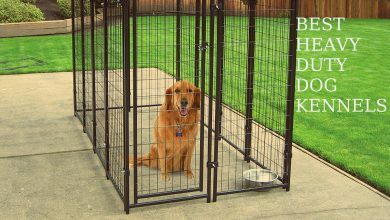 Whatever breed your dog is, whatever size it may be, you will find this cage in different sizes that will turn out suitable for your dog. The cage size ranges from extra small to extra-large. When a company is created for the sole purpose of providing practical and high-performance solutions for the welfare of your pets, you can rest assured it loves pets. The quality, effort, and consistency Petmate puts into its products is what makes it one of the world’s leading brands for all things pets. Who else can you trust your pets with if not someone who loves pets? If you’ve been looking for dog crates for large dogs that are safe for your pets and sturdy enough to hold them in place, the Petmate ProValu Single-Door Dog Crate is the product for you. It is constructed of heavy-duty looped wire panels that aid the overall structural integrity. This is one dog cage your large canine will find tough to crack. 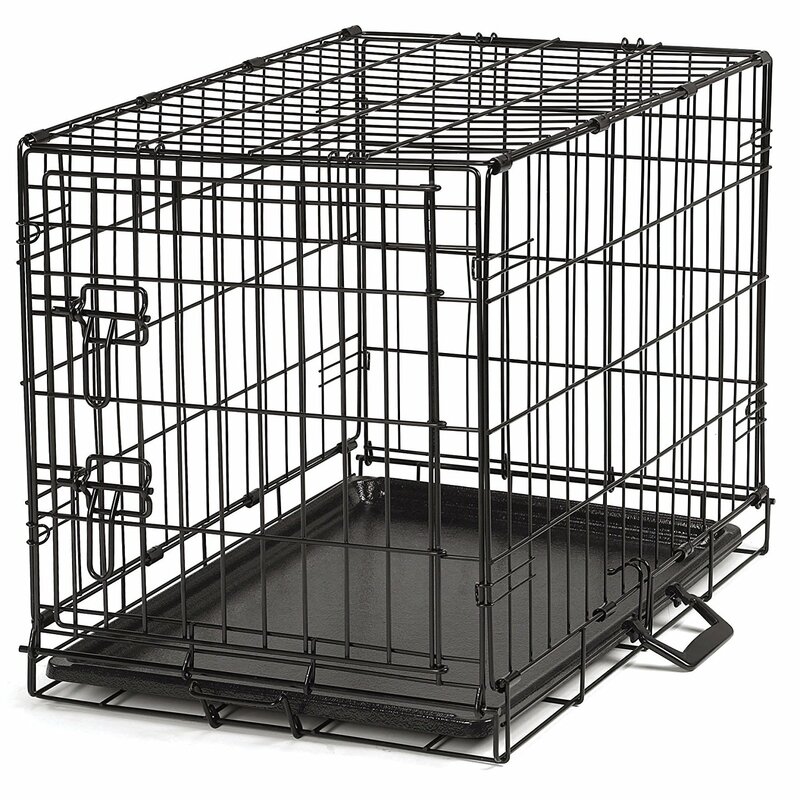 The wires are coated with a rust-resistant finish which makes this cage an ideal outside dog cage. This crate is easy to assemble without needing any tools at all. Just follow the instruction manual and you will set it up in minutes. Just like you easily set it up, you can easily collapse it back into its flat compact size for easy storage and space management. The portability of this cage makes it easy for you to go camping, fishing, hiking, or any outdoor activity you love. You just need to fold the cage and put it in the trunk with other things and off you go to the destination. You won’t have to bother about your dog wandering off as the crate is there to keep it in view. This crate is fitted with a well-designed door which has a 5-point locking system and a latch that is located such that your dog can’t reach it. The wire bars are closely spaced so the paws of your dog can’t pass through, making it impossible to reach the lock. Another nice thing about this wire cage is that it does not restrict ventilation or your dog’s vision. 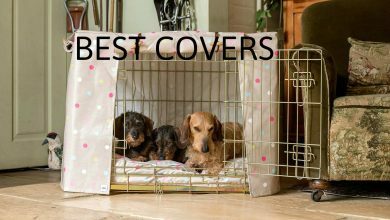 You can choose to make this cage a lot more comfortable for your dog by laying its blanket on the floor of the cage. This will help it warm up and feel cozy in its cage. This cage is also available in different sizes. So whichever size your dog is, all you have to do is go through the manufacturer’s size chart to see which cage size will fit your dog best. Mid-West Homes for Pets is a brand that caters so well for pets it becomes a good idea to want to be a pet. Its products are so wide-reaching there is almost nothing you need concerning your pet’s welfare that you won’t find with this brand name on it. Over the years, this brand has consistently proven its worth by offering only the highest quality, best performance, and practical products. This is exactly why Mid-West Homes for Pets is a brand you can trust and even recommend. If you have been having trouble finding dog crates for large dogs, your troubles have just come to an abrupt end. The Midwest Solution Series Dog Crate is tagged ‘Ginormous’ for nothing. This is a large dog crate designed in particular for large breed dogs. 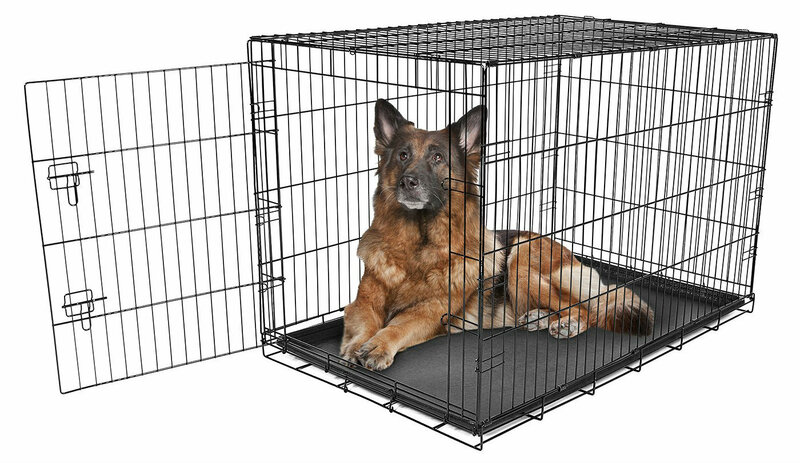 Its huge 54-inch dimension is ideal for those who have had a hard time finding a dog crate size that will fit their dog. 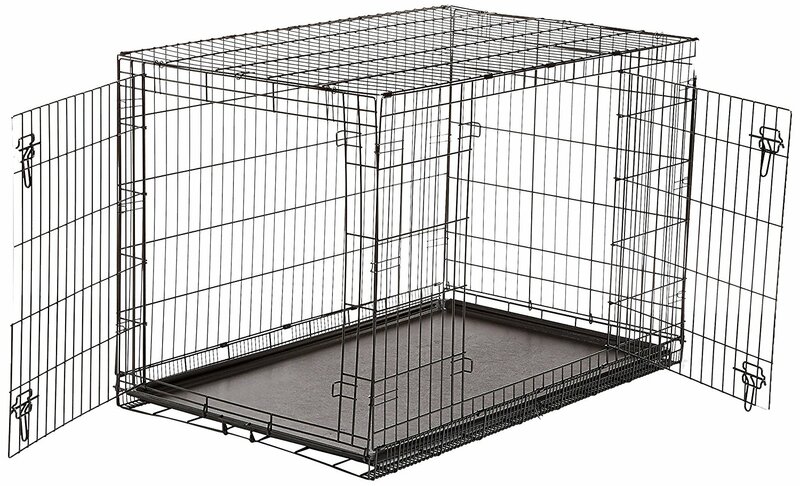 Your dog can sit, lie, stand all it wants in this spacious cage. Due to the size of this cage, it requires two people to assemble. Do note that this does not make it difficult to put together, it is just because of the size and weight. The construction of this crate utilizes a drop-pin lock system which keeps it sturdy and stable when put together. This cage also uses the patent-pending L-Hook which prevents the side of the cage from caving in. This crate is constructed of heavy duty metal which only makes sense considering the size of dog it is meant to protect. This crate also has two doors, one in the front and the other on the side. This gives you and your dog convenient access and exit of the cage. For security, each door is fitted with three slide-bolt locks to keep your dog in the cage when you want it in. The cage also has four rubber feet to protect your floors and carpets from scratches. 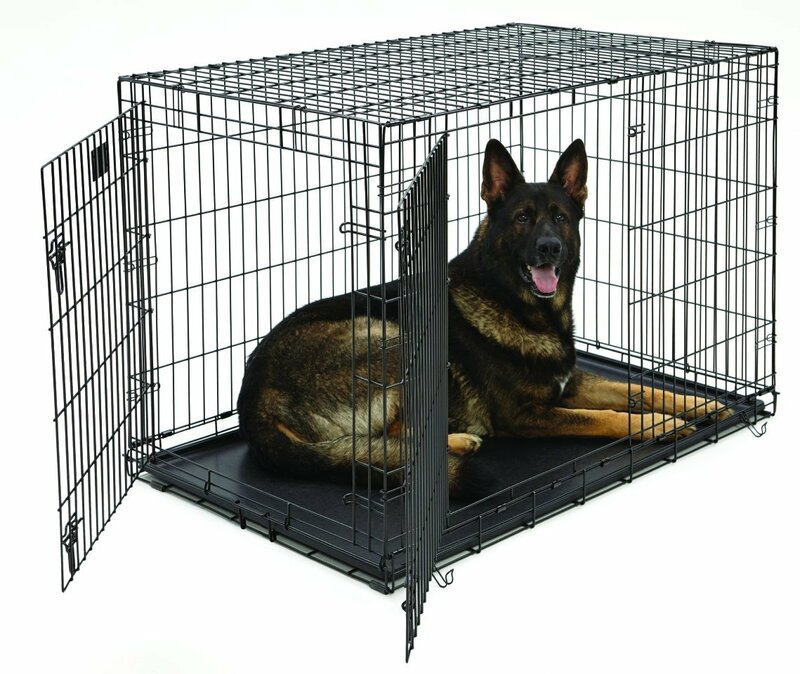 Inside the cage is a leak-proof pan made of sturdy plastic so your dog won’t just lay on bare metal. This floor pan is also removable and easy to clean. If you want to keep your dog extra comfy, you can lay a dog bed on the floor tray so it can feel warm and cozy and always have a good rest. You have done great getting to the end of this detailed piece. We hope you got all you need to know in the buying guide. Now that you have gone through 10 great large dog crates and cages, we hope you now have enough confidence to make a buying decision. If that’s the case, go ahead and make that purchase. How to care for pregnant dog?